"Real discipline" simply refers to the techniques that great parents and teachers have always used to teach children to be respectful, responsible, and cooperative. These days, the most common focus is on infractions and consequences. This approach suggests that discipline is what you do when children do things the wrong way. It's supposed to focus on what you do so children do things the right way. Instruction is a key theme along with prevention. Consequences are an inherent part of discipline, but they are reactive. If you rely on consequences, you'll be exhausted from "putting out fires". Think back to your favourite teacher and the discipline that person used in the classroom. First, nobody's favourite teacher was a "yeller". Instead, your favourite teacher was firm, fair and consistent. He/she rarely spoke to you about what would happen if you did things the wrong way. They spoke about what would happen so you did things the right way. It was a different conversation which focused on expectations, not infractions. Your favourite teacher relied on teaching appropriate behaviour and correcting errors, not assigning consequences for inappropriate behaviour. They preferred prevention techniques such as routines and engagement in learning. Character development wasn't a separate program, it was woven into every minute of every day. Today's popular discipline relies on rewards and consequences. Although these are useful strategies, they are only motivational techniques. They are designed to encourage appropriate behaviour and discourage inappropriate behaviour. They don't actually teach skills. After all, consequences only work on children who care about consequences. Many children develop a "whatever" attitude and ignore adult interventions. Rewards can easily degenerate into bribery which builds selfishness. The focus of discipline needs to be on teaching children the skills of appropriate behaviour - courtesy, respect, cooperation, consideration for others and responsibility. Then, techniques like rewards and consequences can be used to support that teaching, not replace it. That's what "real" discipline is all about. The best parents and teachers always took the time to teach children how to behave appropriately. It is these positive, instructional techniques that are the focus of Mr. Morrish's two books. 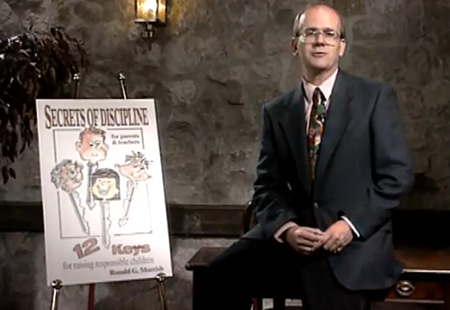 "Secrets of Discipline" presents the basics of discipline in a clear, easy-to-understand style. Only when children are well-trained and well-taught do they handle their choices with respect for the rights and needs of others. 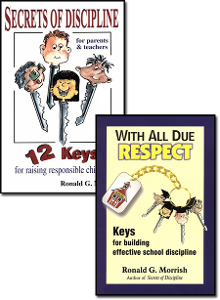 "With All Due Respect" provides educators with the keys for teaching children to be respectful, co-operative, and productive. The value of prevention is stressed. 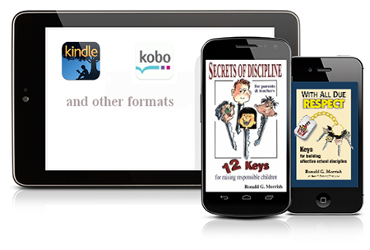 DIGITAL: Both books are also available in digital format through Kindle, Kobo and others. Our children live in a world of social networking and constantly changing technology. Their "heros" are from the entertainment industry, not the space program. Entitlement seems to have replaced hard work as a road to success. Given all these issues and pressures, parents keep searching for effective ways to help their children learn respect and responsibility, values and character. From the foundation-setting of early childhood to the complexity of adolescence, this seminar provides parents with a host of practical, common-sense strategies for raising responsible children. Parents take away many great ideas that they can start using the very next day. For schools to meet their academic goals, it is essential that students behave in a respectful and responsible manner. This requires a combination of positive school discipline and effective classroom management. In this seminar, educators learn a host of practical techniques for preventing behaviour problems, building teacher authority, instilling situational behaviours and resolving incidents productively. Special issues are covered such as adolescent challenges and ADD success skills. Filmed in 1997, in front of a live audience of parents and education professionals, this 80-minute performance will provide you with a host of insights that are still fresh and on-point for today's discipline. Whether you are a parent or teacher, make sure you have these great resources at your fingertips! Learn more about child discipline and education.